To offer Paypal and Ideal as a merchant, you must be registered with the Chamber of Commerce and various personal data of the applicant has to be verified. This is already a first indication that it is not a quick build site. At Saveware, you can easily pay secure and insured with Paypal and Ideal or via Cash On Delivery. How many days to think about the order do you have? Legally you are entitled to 14 days reflection time! If a shop does have any reflection time, this is against the law and doesn’t feel reliable. At Saveware you have 14 working days (instead of weekdays) reflection time to thoroughly look at the purchased item. You can find the company and contact information (easy)? If you cannot find the company information like the Chamber of Commerce number and the VAT number on a website, this is suspicious and also goes for the contact information. On the Saveware website you will find all Company information and can also personally contact us. Do you know when the product is delivered? At Saveware the delivery times are listed at the products and you will receive (at the time of sending) a tracking code to track your order. Which service do you get? At Saveware you are attended to by experienced and qualified staff, who want to provide good service and expertise to you. Please feel free to contact us. How much guarantee do you get? 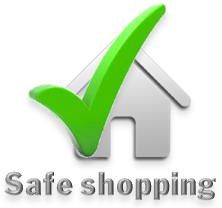 At Saveware you get at least 1 year (factory) warranty on all products we sell. When do you get your money back when returning an item? At Saveware you get (if the product is returned) within 14 days after you cancelled the sale, your money deposited into your account. In practice, this is the same week. On the site of the European Commission you can check the VAT number of a European company (Saveware is a trademark of Fidelia). On the site of the Dutch Police you can check if there are reports about a web site, phone number or bank account number. The editors and publishers of information on this website are fully aware of their role to provide as reliable information as possible. Nevertheless, they cannot accept liability for damage resulting from inaccuracies and / or incompleteness of the information nor for any damage suffered as a result of the use of such information or non-availability of the website. No responsibility will be accepted for the content of websites referred to or referring to this website. Any liability for damages suffered as a result of a visit to another website via a link on this website or otherwise, is excluded. Saveware has created this privacy statement in order to demonstrate that we take your privacy very seriously. The following explains how we treat personal information in the Saveware website (www.saveware.eu). All data collected by Saveware, will be kept strictly confidential and will not be lent, rented or sold, nor somehow be made public. The information you give to Saveware, will be treated with the greatest possible care. The purpose of registering personal data by Saveware is to be able to provide tailored editorial and commercial information to our visitors. At each visit to our website, our web server automatically recognizes the IP address. We use this to process problems with our server and to administer our site. The IP address is also used for statistical purposes, such as determining the number of visits to our website. Our site provides a forum / revieuw opportunity to our visitors. Any information that is disclosed in these places, falls within the public domain. Therefore, be careful with the information you place there. Our sites contain links to other sites and sites of partners who do not belong to Saveware. We are not responsible for the privacy practices or the content of these sites. In exceptional cases Saveware shares information with carefully selected partners to better meet your needs. You will always be informed. Saveware uses security techniques to prevent the loss, mutilation or other modification of information. If you don't want to receive emails from Saveware in the future, please contact us by email: info@saveware.eu. In every email you receive from us, we also give you the opportunity to unsubscribe. Upon request we provide visitors to our site access to all information that we maintain about them. We also offer visitors the opportunity to correct information that we maintain about them. If you wish to access your personal information or want to improve this information, we request you to contact us at the address below.